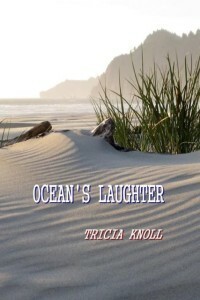 Those who know and love the Oregon Coast will experience a delightful shock of recognition while reading Tricia Knoll’s Ocean’s Laughter. This rich and varied collection about Manzanita – “an emerald of temperate rain-forest on the Pacific Coast ring of fire”– reveals a poet who has not merely observed nearly every inch of beach, type of sea life, and coastal weather event, but who – as a resident – has experienced them intimately for twenty-five years. What remains consistent about this striking collection is Knoll’s ability to turn sharp observation into language that is precise, surprising, and musical. It soon becomes obvious that Knoll is a master of the list poem who revels in transforming piles of ordinary images into monuments celebrating everything from the City of Manzanita’s Lost and Found Department to shopping at a local store. In the latter (“As for Shopping”) we learn we can buy everything from bestsellers to Haitian metal work, from life jackets made for dogs to windsocks. What we cannot find, however, are things like diamond rings, gasoline, labradoodles, and parakeets. Beside all the expected and unexpected items that appear on shelves and all those that would be ludicrous to find, this poem is so much fun to read because Knoll has arranged all seventy-one items she cites in alphabetical order. We browse through her varied lines like shoppers looking for things to relieve the dreariness of rainy days – this area gets 70 to 90 inches per year – or to discover a small treasure we just can’t live without. The poem itself is one of those treasures. We can only guess at the contents of the first thirty-one letters! Undoubtedly, the Council was relieved to learn in #33 that this would be Knoll’s last letter. She was about to move. at the foot of Beeswax Lane. I cleaned St. Helens’ ash from the gutters. are dead. Mother’s ashes on Neahkahnie … . Few local poets are so committed to the art and craft of writing and so passionate about the health of the planet as Tricia Knoll. Ocean’s Laughter exemplifies both. What Sting – the songwriter, lead singer, and bassist for The Police – once said about his own artistic mission can easily define Knoll’s: “All my life I have tried to find the truth and make it beautiful.” Ocean’s Laughter is filled with an abundance of beautiful truths that will touch the hearts and minds of those who know the coast, and will serve as an invitation to visit to those who have yet to explore its rugged richness. Carolyn Martin’s poems and reviews have appeared in publications throughout the US and UK. Her second collection, The Way a Woman Knows, was released by The Poetry Box, Portland, OR in 2015. So, I am not the least surprised at the interview. Tricia knows how to describe her world in carefully chosen words and images. It is a technicolor/digital variation of a word symphony.